The final trek is over, all of our cameras are in and the fieldwork for Project Black Cloud has, at last, come to a close. And it was just in time too! During December 2013, the floods that swept the east coast of the peninsula arrived in Kenyir, submerging the area under our house. In the forest, what had previously been innocent-looking streams rapidly turned into swollen rivers. The team managed to safely negotiate these, but sometimes needed the help of rattan ropes strung across the river. This one-year project in its current form comes to an official end as Laurie puts the finishing touches to his Master’s thesis – but fear not, we’re not done with Kenyir just yet. 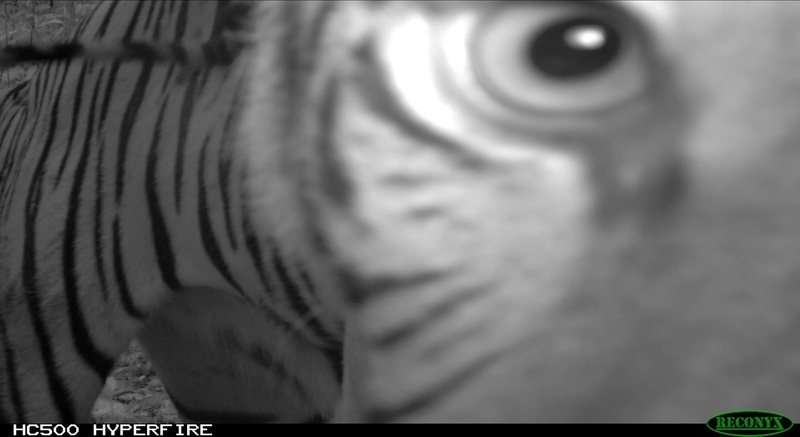 The data retrieved from the cameras have managed to live up to Kenyir’s high standards, with a full suite of mammals that we’ve become accustomed to witnessing. The tiger cub appears to be doing well and was venturing further afield. Otters and Dhole (Cuon alpinus) have made their sporadic (though rare) appearances. 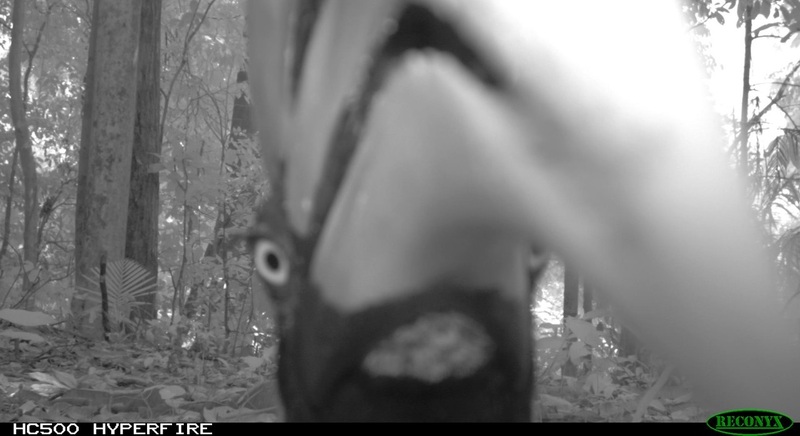 A pair of Great Hornbills (Buceros bicornis) appeared to be very interested in a pair of cameras and had a great time pulling bits out and poking holes in one of them. On the Leopard (Panthera pardus) and Clouded Leopard (Neofelis nebulosa) front we’ve had the usual appearances from individuals previously identified, but no new additions this round. 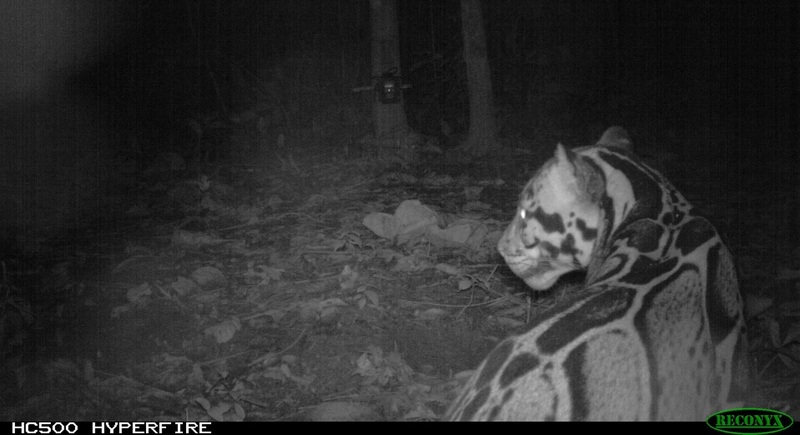 At one point we thought we might have a romance on our hands, with two clouded leopards following one another, having been detected within minutes of each other from different camera sites. However, on closer inspection it turned out that both were males and possibly brothers. Still heart-warming nonetheless! So with all the data in, the next part (though involving slightly less excitement) of the project began – analysing the data. With all the numbers crunched and churned around, we’ve managed to get a result for the density of leopards and clouded leopards from our study site! Using a method known as ‘Spatially Explicit Capture Recapture’ (SECR) we estimate around 3.00 and 2.64 leopards and clouded leopards respectively per 100km2 within the area. Using habitat use analysis, we also found that the clouded leopards appeared to have a curiously intense level of use of the area next to a very large region of clear-felling for a new dam. This could be due to two possible reasons: 1) the clearing has caused clouded leopards to escape the area into the adjacent region of forest, or 2) the clearing has attracted prey (which may feed on the primary growth) which the clouded leopards are in turn attracted by. The density results are encouraging and provide evidence that an apparently healthy population is able to survive in Kenyir – supporting our calls to protect the area. They also provide a baseline figure with which we can compare later figures in the future, to assess population trends. 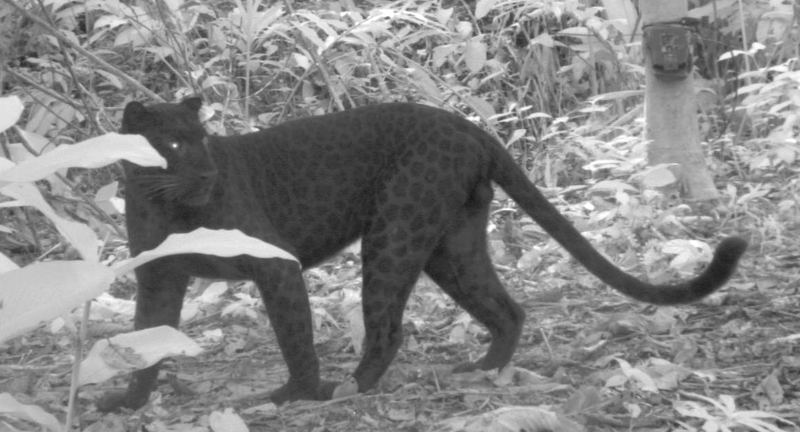 The figure for Leopard represents a first for Malaysia, and is also the first time a population estimate has been obtained for a melanistic animal anywhere in the world! However, along with all this great news from the forests of Kenyir, our cameras have also shown a new dark side that is of great concern. The level of poaching activity soared in the last few months of camera-trapping, with larger numbers of Indochinese encroachers captured on our cameras compared to just a few months ago. Some were recently arrested in the region but many more continue to operate unchecked. Whilst this development fills us with sadness, we must learn from them and recognise that our forests are not safe for wildlife until measures are taken to protect them. So it’s with a renewed sense of urgency that we pursue the ongoing mission to fully protect the Kenyir rainforests for future generations. We shall keep you posted! Thanks for your support Kim Chye! We hope the same too. Very happy to know that Kenyir has such a rich mammal life but at same time worried about poaching. Hope your findings can spur more vigilance by the authorities. Care,to share,how you did the habitat use analysis?